Sign in to shop or access account information. Don't have a shopping account? Create one now. NEW © 2020: Connect your students to strong literacy foundations, inspiring literature, and the world around them. Explicit, systematic, research-based instruction ensures active learning by all students. Share your passion for literature while inspiring students to discover theirs with print & digital. NEW: Personalized learning solution that helps students reach their full potential as writers. Build literacy skills for students of all ages with Reading Mastery, Corrective Reading, and more. Learning solution that maximizes every moment for all students to progress toward high-level achievements. Research-based, research-proven instruction that gives all children the opportunity to succeed. Reveal the full potential in every student with powerful explorations and rich mathematical discourse. The latest in adaptive instruction, gamification, and digital project-based learning. Problem-based core curriculum designed to address content and practice standards to foster learning for all. Adaptive software that delivers personalized learning paths based on what students are ready to learn. Develop math skills through explicit, systematic instruction with Connecting Math Concepts and more. NEW: Uses the 5E framework. In-depth, collaborative, evidence-based, and project-based learning experience. Promotes inquiry and real-world problem solving with phenomena and hands-on activities. NEW: Student-centered, written to the C3 Framework, grounded in inquiry, and aimed at developing active citizens. Powerful and flexible standards-based curriculum to spark inquiry and ensure social studies mastery. Engaging media-rich social studies supplement to build critical thinking, writing, and research skills. Uses the highly explicit, systematic Direct Instruction approach to accelerate reading for striving learners. Provides evidence-based reading intervention to lift comprehension and fluency for struggling students. Provides supplemental, hands-on and game-based resources to scaffold instruction and increase math proficiency. Delivers teacher-directed, intensive instruction to develop conceptual understanding and problem solving. Research-proven, teacher-led math intervention program helping math-challenged learners achieve success. Brings together quality music, animations, games, and more to help teachers deliver inspiring general music instruction. Explore music from a sociological perspective and take your students on a journey tracing the history and influence of music. Develop confident, strong musicians from day one with an inspiring program designed to help students truly enjoy choral singing. Explores all aspects of theatre, including Acting, Directing & Producing, Technical Theatre, and Writing & Theatre. Delivers user-friendly, step-by-	step instructions for studio projects, including supplemental resources and self-assessment. Studio-oriented digital art program. Focuses on the elements and principles of art, art media, art history, and art criticism. 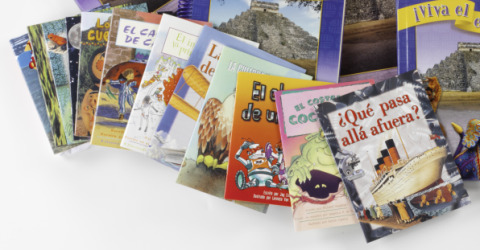 A collection of age-appropriate literature in Spanish is included at each level. The themes of the Classroom Library books are tied to the unit content and themes and there is one title for each unit. Each story is also recorded on the Classroom Library Audio CD. The purchase quantity range should be 1-29 for this product. ©2019 McGraw-Hill. All Rights Reserved.